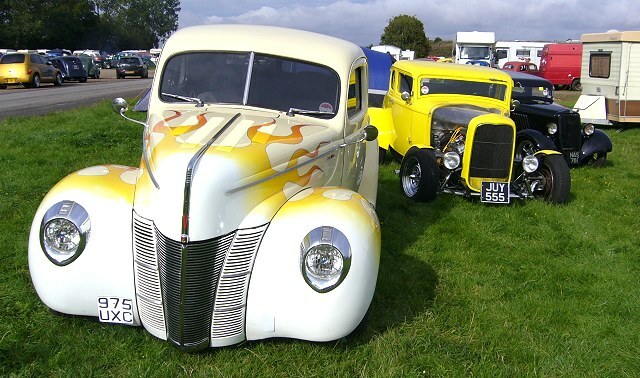 Organised by the NSRA in conjunction with Santa Pod Raceway, another hot rod meet rolled up into a weekend of nostalgia style drag racing. Run what ya brung for pre-1973 cars. 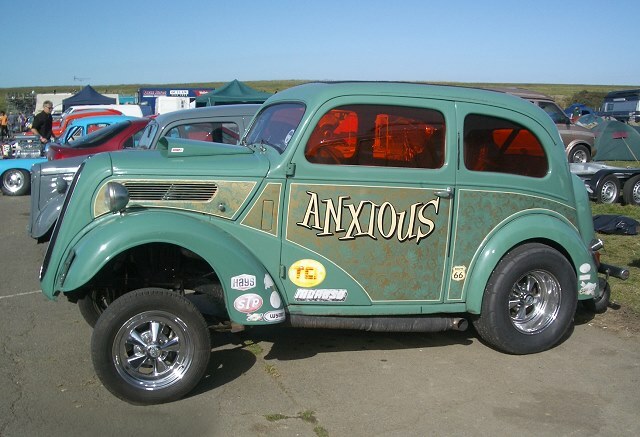 Hot rods, customs, Outlaw Anglias, dragsters, altereds, and the Gasser Circus! Full 2019 details to follow.. 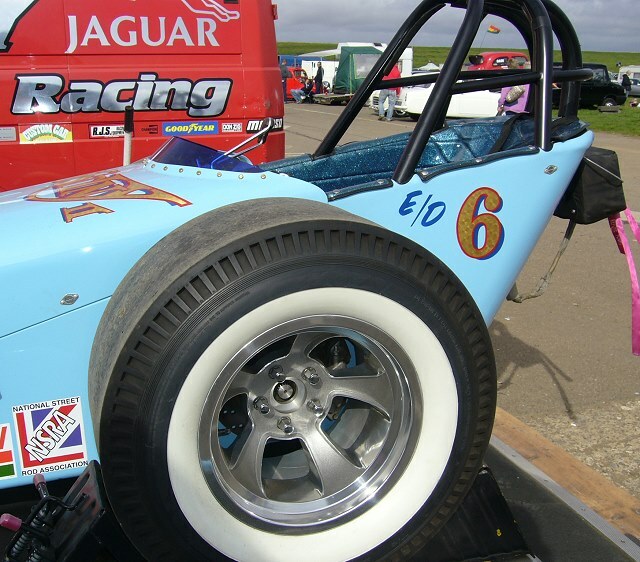 Following a comprehensive risk assessment and, mindful of Santa Pod’s experience of young drivers piloting Junior Dragsters, it will be possible to run Tot Rods at the NSRA Hot Rod Drags and the NSRA Nostalgia Nationals events, as long as a basic set of build standards and driver details are adhered to. Important: please click here to view the Tot Rod Regulations. 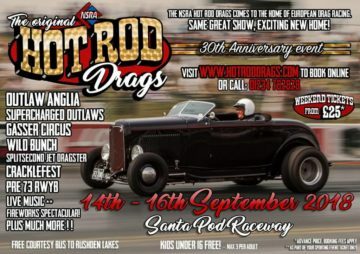 The 2018 Event: The 30th Annual Original Hot Rod Drags. It hardly seems possible. Three decades on and still going strong. That’s getting on for nearly half a lifetime and I don’t think that, even in our wildest dreams, we ever imagined back in 1989, looking out across the pits and realising that people did actually want to come and share our dream of a Rod Run that happened to take place at a race track, that we would still be in the driving seat thirty years later. 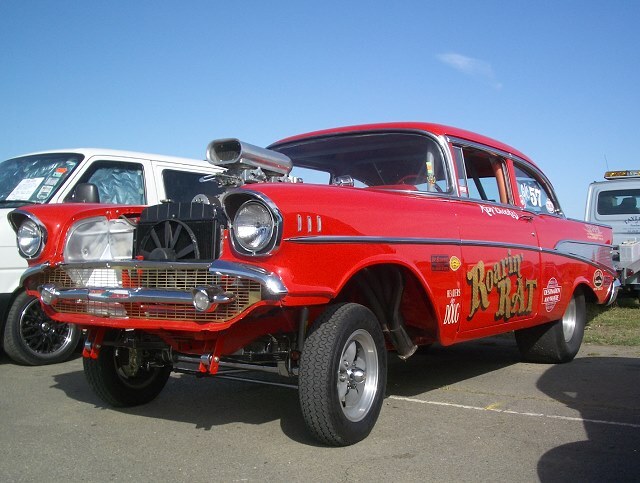 We certainly never expected to be welcoming you all to Santa Pod Raceway, that’s for sure. 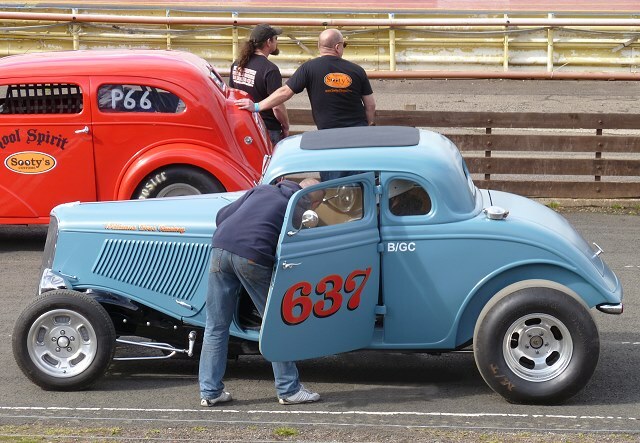 With the twenty-fifth Nostalgia Nationals under our belt, the Hot Rod Drags, for the first time at The Pod, is shaping up to be pretty special. It’s a milestone event in more ways than one, most certainly the start of a whole new era. Other than the location, everything will be pretty familiar to ‘the regulars’. The same emphasis on Pre ’73 Run What You Brung action, the track will be open for all eligible vehicles (silenced or not) ALL DAY on Friday. The gates will open at 12 noon on Thursday for early arrivals (£5.00 pp extra). There will be live music from Eastwood and Skabucks, with resident DJ Grant Pinney on both Friday and Saturday night and the courtesy bus, which was very popular at the Nostalgia Nationals, will again be travelling to and from Rushden Lakes all day Saturday. Saturday and Sunday again see plenty of Run What You Brung action and it wouldn’t be the Hot Rod Drags if we didn’t have the massed ranks of the Gasser Circus, Wild Bunch, Outlaw Anglia and Supercharged Outlaws adding their own brand of entertainment to the proceedings and somewhere in the mix will be Chevrolet’s finest strutting their stuff in the Tri-Chevy Shootout. Not to be outdone, Roger Goring will also be putting the Firestorm jet funny car through its paces too. Just for good measure, Saturday evening will feature the, now traditional, Hot Rod Drags rolling Cracklefest followed by a tremendous firework display. As always, the NSRA will be on hand to provide the passes to allow you to sign on if your car meets the criteria and point you in the right direction if you need any help. 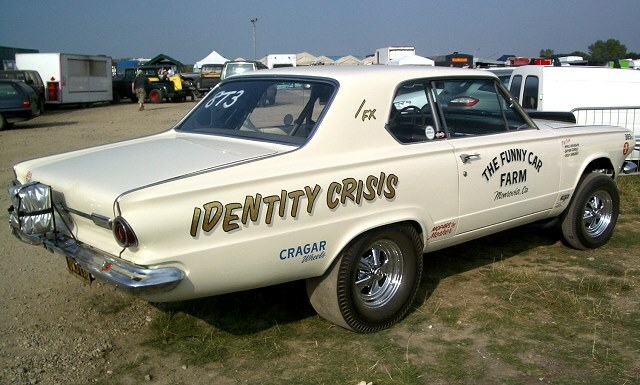 The criteria is pretty basic, pre 1973, no rear engined race cars and no bikes. Other than that you are good to go. 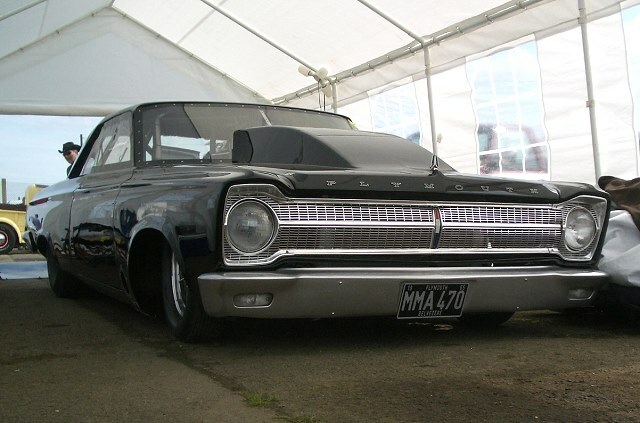 The NSRA crew will also be keeping an eye on the track action, to select the recipients of the ‘Dirty Dozen’ trophies. They will also be ‘setting up shop’ to sell their range official goodies. 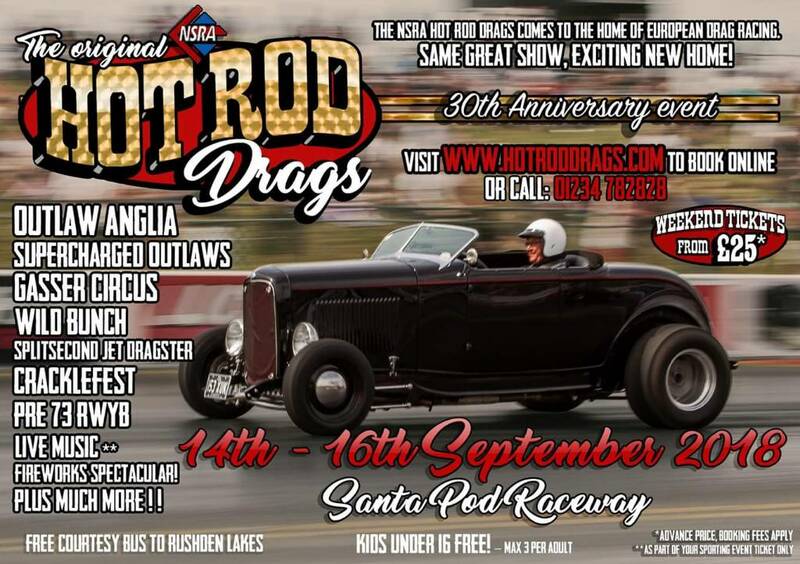 We’d like to welcome you to the Hot Rod Drags merchandise stand, situated near the front of the staging lanes, where, as in the past, you will be able to come and have a chat, trade insults with Steve, tell us what you think and hopefully buy a t shirt or hoodie or two. In another return to tradition, they are all strictly limited edition, so when they’re gone, they’re gone. Most of all we’d like you to help us celebrate thirty years of the Hot Rod Drags and raise a glass to the next thirty years. Martyn, Steve and Alan. The Hot Rod Drags team. 3. 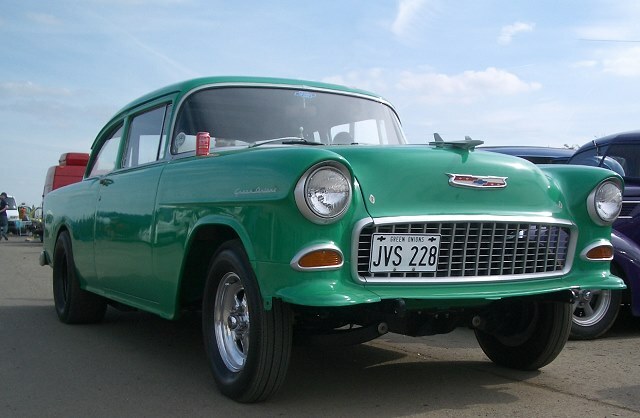 Quickest Outlaw Anglia, Colin Miller time and speed to come. 8. Brandon Vining also took the quickest reaction time of the whole weekend with his Tot Rod, an incredible 0.0085 seconds. Read ‘A New Era’ .. the move to Santa Pod explained. Some photos from a previous event. Click images to enlarge and browse..